The social unrest in Venezuela over the last two weeks has been the most widespread since Leopoldo López, the opposition leader, was arrested and subsequently imprisoned by the administration of President Nicolás Maduro in 2015. The latest anti-government demonstrations were sparked by a decision by the country’s Supreme Court, which is controlled by the regime, to nullify the National Assembly, which is dominated by the opposition. The Supreme Court later backtracked, but it was too late—critics of the regime had been emboldened once again by the audacious move. Luisa Ortega Díaz, the country’s attorney general and traditionally a supporter of Maduro, also condemned the Supreme Court’s attempt to consolidate power, further eroding Maduro’s legitimacy. Their indignation was stoked by the move a few days later to ban Henrique Capriles, a prominent member of the opposition, from politics for 15 years. Capriles, who has run twice as a presidential candidate, is one of the opposition’s strongest hopes for winning presidential elections against Maduro’s United Socialist Party (PSUV) at the end of 2018. A chronic economic recession in Venezuela has provoked sky-high inflation, shortages of basic foods and goods, and a collapse in the health and education systems. Maduro’s popularity has dropped steadily, yet the Venezuelan people have so far showed incredible tolerance for what many of them have been reduced to—searching for food in the trash, waiting for hours in line to buy basic goods, often at inflated prices, and scouring the country for black market medicines as they watch their family members suffer and even die. But the current economic and social predicament has had another sinister consequence: It has fed the growth of criminality and organized crime to unprecedented levels. Venezuela’s homicide rate is one of the highest in the world, and Caracas is now the deadliest city on earth. New forms of organized crime have emerged in the country’s prisons, within its armed forces and on its streets in the form of megabandas since Hugo Chávez took power in 1999. Drug trafficking has penetrated the highest levels of the current regime, all the way up to the family of President Maduro. Armed, civilian groups known as colectivos, which were embraced and nurtured by Chávez as defenders of the revolution, have gone rogue and are increasingly supporting themselves through criminal earnings. Unbridled corruption has allowed for kleptocrats to plunder the country’s public coffers via artificial exchange rates and the state-owned oil company Petróleos de Venezuela (PdVSA). Below, we look at some possible future scenarios and their implications for organized crime. Criminal elements within the regime and outside it would like nothing more than to maintain the status quo. The armed forces are the muscle and political backbone of the sitting government. Out of Maduro’s 32 government ministers, 11 of them are acting or retired military officers. 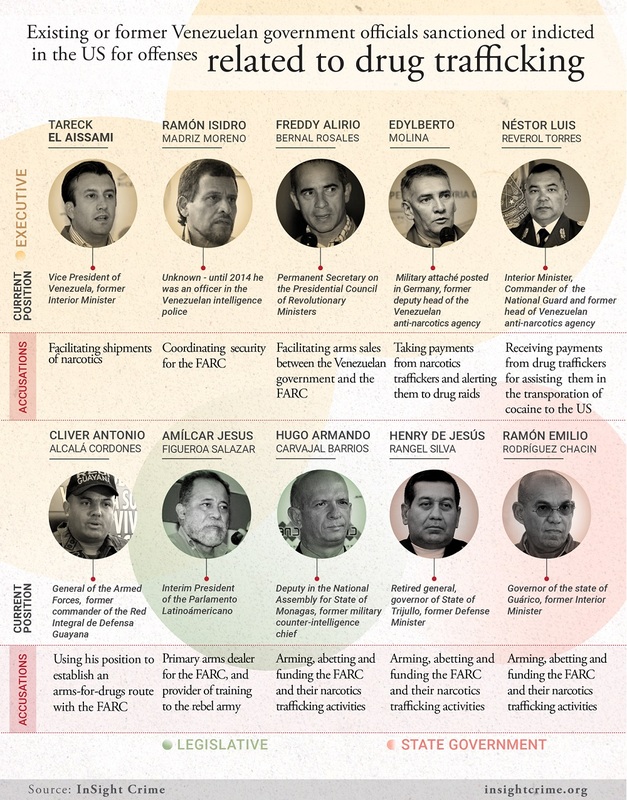 Some have been sanctioned or indicted by the United States for their links to drug trafficking [see graphic below]. 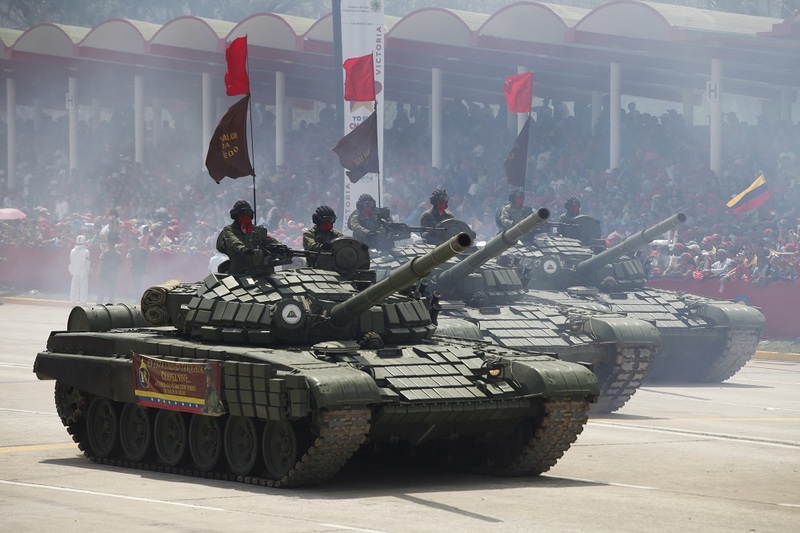 The armed forces have deepened their role in transnational cocaine trafficking since 1999, in part as a direct result of political decisions by Hugo Chávez, and profit from other criminal incomes such as the sale of government-subsidized contraband petrol on the Colombian border and the process of food distribution, of which they are in charge. The National Guard controls the nation’s borders, airports and ports and has been implicated in some of the biggest cocaine seizures in recent years. Criminality isn’t just limited to military members of the government. Vice President Tareck El-Aissami was recently sanctioned by the United States for his alleged role in drug trafficking, dating back to his time as governor of the state of Aragua. Should Maduro decide to fall on his sword, El Aissami is in line to replace him as president. That could result in a political shakeup and give the regime a chance to renew itself with some internal changes and shifts. If El Aissami changed tack on the regime’s economic policies and reversed some of the damage done in recent years, he could improve the PSUV’s chance of winning presidential elections at the end of next year—something that Maduro almost certainly couldn’t pull off at this stage. It is unclear, however, which way El Aissami, a party hardliner, would go if he became president, and his status as a suspected drug trafficker might not inspire new confidence in Venezuelans already sick of corruption and the abuse of power within the current system. For other criminal elements, maintaining the status quo remains the best option. 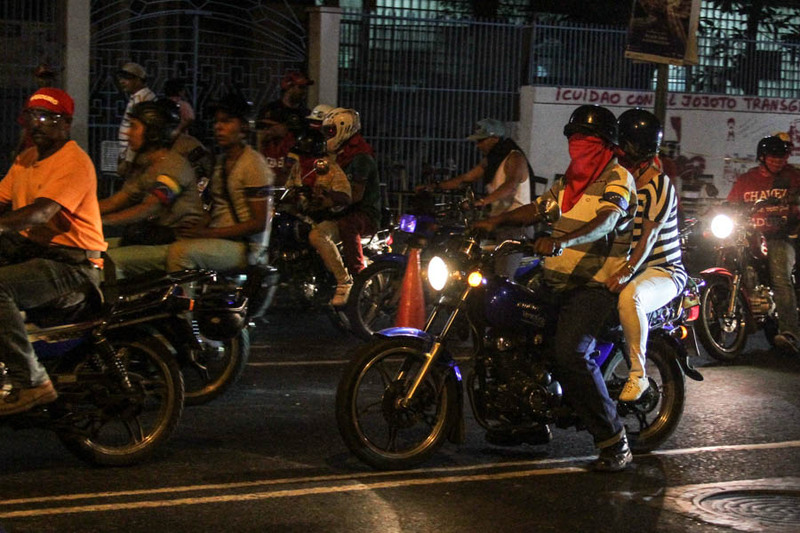 The armed pro-government colectivos, many of which are perceived as violent thugs by those living in territories they control, depend utterly on the socialist regime for their survival. InSight Crime investigations in the 23 de Enero neighborhood of Caracas, once a bastion of Chavismo, show that these groups are increasingly profiting from criminal activities such as extortion and micro-trafficking. They are also involved in anti-crime raids, known as Operation Liberation and Protection of the People, in which they work alongside state security forces to suppress criminal groups and megabandas. Those raids were instigated as the result of the government’s failed “peace zone” policy, which handed swathes of territory over to the criminal gangs that occupied them. In effect, the plan made megabandas the de facto law in those areas, because security forces were prohibited from entering without prior permission. Many of those peace zones still exist. Although the megabandas openly attack patrols and headquarters of Venezuelan security forces, and have been forced to regroup following the elimination of many of their original leaders, they continue to run their criminal economies that include extortion, kidnapping, contract killing and micro-trafficking. As for the country’s prisons, criminal business has never been so good, even though violence and overcrowding are serious human rights problems. The creation in 2011 of a Ministry of Penitentiary Services effectively handed governance of the country’s jails to the powerful bosses on the inside, known as “pranes,” who now run them like their own fiefdoms. Violence remains one of the main means of maintaining control. The decision to reverse the Supreme Court ruling to annul the National Assembly could be a sign that the Maduro administration is faltering. 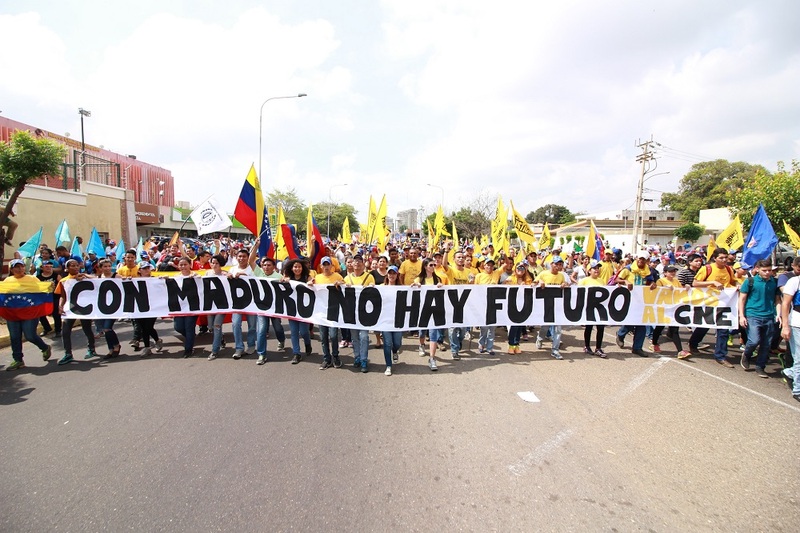 The Miami Herald reported that the president has secretly offered the opposition a deal that would result in regional elections supposed to take place this year, in which the opposition looks set to win a strong foothold. Given the hostility between the government and the opposition, and the failure of Vatican-monitored talks at the end of last year, this seems like the least likely scenario. Should it happen, it is likely to be thwarted by infighting and disagreement between the different sides. The coalition would have to come to an agreement on long-term and fundamental issues such as the role of the military in the country, security, the prison system and economic controls. In this unlikely scenario, the main casualty could be the colectivos, which the Maduro administration might be forced to call to heel as a condition of a joint government. They may have limits put on their weapons as well as their role as repressors of the media and critical protests. Other than that, there would be little change on the ground in the short term as far as criminal dynamics are concerned. The importance of the support of the armed forces for President Maduro and the regime cannot be overstated. But factions have turned against the regime before, as was seen in the failed coup against Hugo Chávez in 2002, which removed him from power for a couple of days. In the short term, the colectivos and the military itself would be the criminal elements most impacted by a move by parts of the military to force Maduro’s hand. The armed forces would want to assure their place at the table in the new government, and might offer the colectivos—who are despised and feared by the opposition—as a sacrificial lamb. Should this scenario arise, the political uncertainty it could generate might push the reality on the streets in Venezuela to get worse before improving. It would have little immediate negative impact on the megabandas or the criminal enterprises being run in the prisons. If anything, criminality and impunity would only increase, giving these elements more freedom of movement. Longer-term, an administration capable of governing could take steps to curb their criminal freedoms and fiefdoms. The military, as broker and mediator, would have to make some concessions of its own. Should the armed forces be involved in brokering or forcing this potential transition, implicit in its negotiations would be the continuation of its stewardship of the country’s ports, borders and airports—a fundamental element of its role in profiting from transnational organized crime. The amount of coca and cocaine being produced in neighboring Colombia is booming, and the network of Venezuelan military officials involved in the drug trade, known loosely as the Cartel of the Suns, would want to keep its interests safe. But heads would have to roll as part of a change in government, and many on the chopping block would be those military officials seen as being the most corrupt and most loyal to the socialist regime. There is little doubt, however, that they would be replaced with others equally willing to profit from their power and position in this key transit nation in the global cocaine trafficking industry.